Expected Rate of return is the rate that one would look for when he invests in a market security. This expected return is based on the past data and is usually taken on an average basis. For example, if a person invests in a security which has 30% chances of getting a 10% profit and another 70% that it may result in a 20% loss, then the expected return for the person will be 11% loss (0.3*0.1 + 0.7*-0.2). What is Risk- Free Rate of Return? The Risk-Free Rate of Return is the rate of return an investor expects from any investment carrying zero rate of return. This is usually a theoretical rate which any investor expects. If a person invests in any security, he expects to earn at least that return that he would earn from investing in a risk free security with no fluctuations. The risk he undertakes on the securities is for earning a better return. In U.S. generally the rate of return on a three-month Treasury Bill is regarded as the risk free rate of return for other securities. Beta Coefficient is the coefficient of sensitivity or the systematic-risk of the security in comparison to the market securities. The beta coefficient is a major determinant of calculating the return that should be made for covering the risk. Beta coefficient is calculated on the basis of Regression Analysis. A beta tends to respond as per its coefficient to the Market Movements. For deeper insight to the Beta Coefficient model visit our site: assignmenthelp.net. CAPM Model stands for Capital Asset Pricing Model. It is also known as Security Market Line Model. It studies the relationship between the Risk in the securities and the Expected Return from those securities. CAPM model is widely used for the pricing of securities and checking the vulnerability of securities to the outer risk. The CAPM model is based on certain assumptions which generally are theoretical in nature. Investors wish for maximizing of wealth. Investors can borrow or lend unlimited amount at a risk free rate. All investors are rational and wish for same return. There is no restriction on short sale. Quantities of all assets are given and fixed. The investors are price takers not the price makers. All assets are divisible and can be sold at any time in the market. The basic focus behind the CAPM model is that the two factors i.e. Time Value of Money and Risk should be compensated by the return of the security. 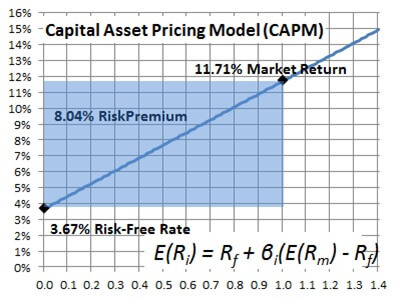 Thus CAPM Model determines the price of asset taking into consideration the risk and return. Want deeper understanding to the CAPM formula? Visit assignmenthelp.net. The assumptions clearly state of no transaction cost whereas in practical world there is a transaction cost attached to every transaction. The Taxes always exist in the practical life; therefore, contradicting another assumption. In real market the price of securities is constantly and every day changing which makes the market more sensitive and volatile. The CAPM model cannot work in such environment. The calculation of Beta is necessary for the implementation of CAPM Model. The calculation of Beta is complicated and not accurate always. The expected return is not reliable as the market return can fluctuate anytime. Even when the Beta of the market is calculated, it does not stay stable. It frequently changes thus rendering the CAPM Model inefficient. Apart from the drawbacks, the model is highly used and is a major indicator and tool for setting prices of the securities. Want more explanation and deeper insights to the CAPM Model? Visit assignmenthelp.net now and have access to many more such assignments. You can also take online classes from our Tutors and get you queries cleared. Finance assignments can be difficult and confusing. But we know what you need help in and here are we providing the best facilities and working dedicatedly and efficiently. Our good work and efficiency is what differentiates us from others. You will get best and professional help from our teachers. Your queries will be answered immediately. The motivating and active staff is available at your services 24*7. You can have a view to more of our articles and assignments on our website: assignmenthelp.net. Visit now and get good marks on your scorecard.